As anyone who has been to, or ran, the New Balance Falmouth Road Race can attest, the annual mid-August, sea-side race is not known for being held in mild temperatures – however, much to many participants’ delights, Sunday’s 46th running of the iconic road race took place throughout a cloudy and uncharacteristically chilly 60-degree day. 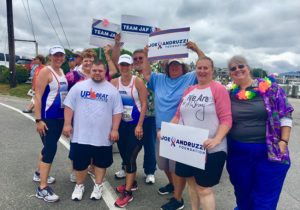 There was nothing mild about the Joe Andruzzi Foundation’s 2018 “Team JAF” Falmouth Road Race runners, though, who had spent all of the summer burning up the fundraising charts. By the time all 64 Team JAF runners had crossed the finish line, they had collectively raised more than $115,000 in support of New England cancer patients and families! It’s hard to believe this was our seventh consecutive year fielding a team for the event – it feels like it was just yesterday that we ran our first “Falmouth” in 2011. Since that first race, nearly 400 Team JAF runners have come together to raise over $650,000 towards the Joe Andruzzi Foundation’s mission. Simply amazing. Our 2018 Falmouth Road Race team consisted of a diverse, generous, and passionate group of runners – from social workers to cancer patients – all with a single goal: to ‘pay it forward’ to those in need. To these incredible runners: please know that there is nothing more selfless in life than sacrificing time, resources, and sweat for a greater purpose, and we want you to know just how much we appreciate it. Your hard work will provide much-needed relief for the patients and families JAF serves throughout the year, and for that we will forever be grateful. A special shout-out is due to our top five individual fundraisers who went above and beyond the minimum donation: 1) EJ Whelan, 2) Cheryl Bergman, 3) Katie Kantrowitz, 4) Kayla Florence, and 5) Erin DeStefano. It was truly a superhuman effort by all of our runners, though, and the Foundation thanks you from the bottom of our hearts! After the race, we were once again fortunate to gather our team at the Kelley family’s beautiful home for a back yard celebratory barbeque, where our runners were joined by their families and friends to decompress and celebrate all of Team JAF’s hard work. 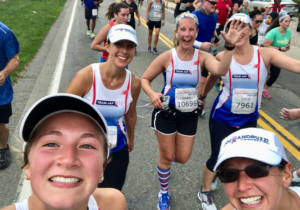 Everyone also had the chance to hear from first-time Team JAF runner, Dana D’Alessandro Haseotes, a women’s oncology clinical social worker at Women and Infants Hospital in Providence, RI. Dana shared how fortunate she feels to be able to refer her patients to organizations like JAF in times of need. 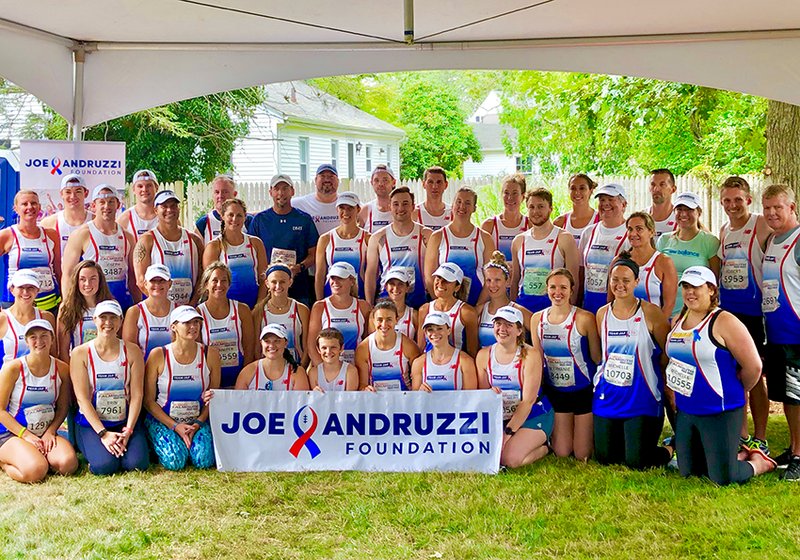 Our immense gratitude also goes out to our amazing partners and supporters that made Team JAF’s 2018 Falmouth campaign possible: Falmouth Road Race staff and volunteers for another flawlessly run event; FRR’s Numbers for Nonprofits Program for granting us bibs for the race; New Balance, for our beautiful new singlets; our Team JAF cheer groups who lined the race course throughout the day, giving our runners an extra boost as they zipped by; and everyone who helped put the post-race party together, including Patty Kelley and the Kelley family, the Sausage Guy, Cavossa Disposal, Busy Bee Jumpers & Tents, United Site Services, Wines and More, and JAF’s amazing staff, board, and volunteers! We can’t thank you all enough! And, of course, we want to thank the benevolent community of donors who supported the campaigns of our Falmouth runners. Your generosity makes a direct impact in the lives of those battling cancer throughout New England, and we hope that is something you take great pride in knowing. And, once more to our runners – and certainly not the last time you’ll hear us say it – THANK YOU for your commitment to our mission. What makes you so unique is that you can choose to do whatever you want with your time, and you choose to harness that power, join Team JAF, and pay-it-forward for the betterment of those in need. The sacrifice and commitment you have made for those in need is inspiring and perfectly mirrors our mission. We are thrilled to have you in our corners. We can’t wait to see you all cross the finish line in 2019! P.S. – Check out photos of Team JAF at the Falmouth Road Race here.